This blog was authored by Casey Aldridge, a first-year student at the University of North Carolina at Charlotte. One Monday in October 2013, I made the five-minute walk to the student center at the University of North Carolina at Charlotte for a protest that I helped orchestrate. The protest, directed at a Bank of America recruitment session on campus, was part of a nationwide campaign by Rainforest Action Network to tell banks to “Stop Financing Climate Chaos”. Activists disrupt Bank of America recruitment at UNCC in early 2013.Working with about twenty students and a pair of local activists, we arrived at the recruitment session. Our plan: to mic-check the presentation, showcasing our banner that denounced Bank of America’s policy of funding mountaintop removal and coal. Our goal: to get our point across to potential Bank of America recruits; Bank of America’s addiction to coal – investing $6.4 billion in the dirty energy over the last two years – is destructive to our shared planet. We stormed in – banners high – making our presence known next to the stage where the bank representative stood and preached a deceptive gospel of unlimited markets and perpetual growth. We only reached the second line of our mic-check before the campus officer ordered us to leave the room immediately. Having previously agreed to follow any orders, our group filed out of the lecture hall, and was escorted outside by police, where our names and identification numbers were taken. My involvement in this RAN campaign was my first on-campus protest, and unlikely to be my last. The more I look back on that action, the more the five-minute walk from my dorm to the Cone Center stands out in my mind. Those five minutes were what it took for me to physically attend the action, but in my personal story of protest to the destruction of Bank of America and others, those five minutes were merely the tail end of years of my evolution into an environmental activist. Occupy Wall Street's spontaneous democracy My infatuation with activism began when I began following the news in early 2011. That year was truly an incredible one, from the Arab Spring to student movements in Chile and strikes in Spain. And in the US, what began as a labor uprising against Governor Walker in Wisconsin had evolved into the Occupy Wall Street movement. Never had I felt so inspired and galvanized into action as I did in 2011. The community and compassion I witnessed in global uprisings had stirred a passion to devote my life to leaving this world better than I found it. Superstorm Sandy was a wakeup call for CaseyMy favorite thing about Occupy was its intersectionality, but when my “activist journey” began, class activism was my “focus”. Then, in October 2012, there was Superstorm Sandy. The intersectionality of class and environmental activism was more defined than ever; Wall Street fueled this hurricane, a storm responsible for over 250 deaths. 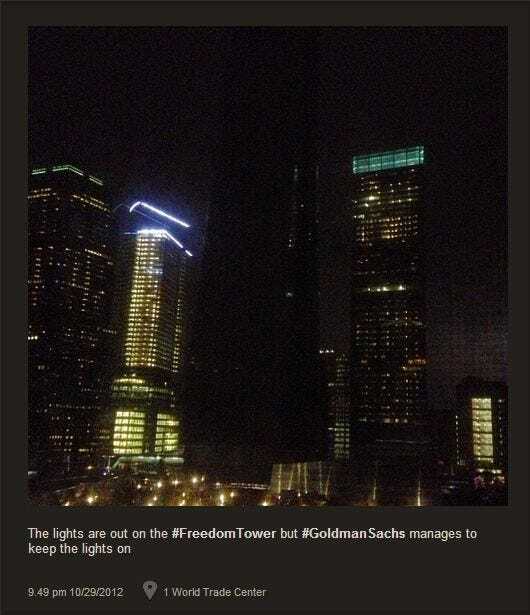 And while the lights were out in nearly all of Manhattan, one building still lit the skyline, and that building was Goldman Sachs. And while the aftermath of Sandy heightened inequality in the largest city in the United States, and even greater disparity between the US and other countries in Sandy’s wake, it hit me that the only cause grander than the 99 percent was the 100 percent. Casey Aldridge marches with fellow North Carolina studentsFast-forward one year and I’m ready to protest Bank of America for putting profit before the planet and everyone on it. This is the culmination of a walk that took years, but of which I was now at my destination. There is no way to know where this journey takes me next, from an oblivious high school student in 2011 watching the Arab Spring to an advocate for environmental justice, only that I do know this: I have no option but to continue my work with RAN, Charlotte Environmental Action, and others to ensure the continuity of life on earth. Sign here petition to join Casey and thousands of other students in demanding that big banks stop funding coal and climate change.